I just collected a pair of calf length boots today. They were on sale online (Tesco) £13. My first calf length boots. 4" heel block heel and comfortable to wear. The only thing I'm not sure about is the fact the heel looks more brown than black, but think I will be keeping them. I keep an eye on the ladies shoes for sale at Tesco, I don't know how I've missed these. Will have to have another look! They look VERY wearable, and an unbeatable price too. I haven't seen the boots in store. I followed a link from this site (if the link is for this country I click as it helps keep this site running, I think) while looking I went into the sale section. Just too look. Famous last words. Hope this link takes you to the right pair. 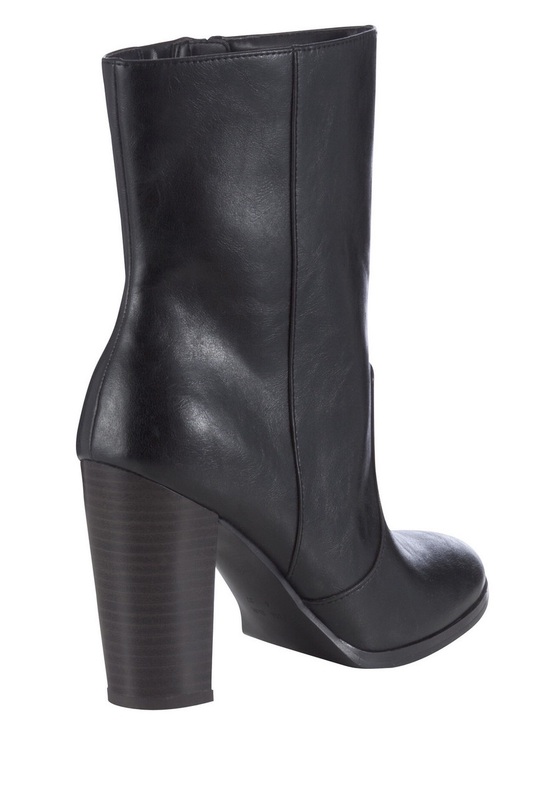 Very nice boots; pity they only go up to size 8. If the heel colour is not acceptable, it should respond to blackening with either shoe dye or a satin paint. You would likely lose the imitation 'stack' effect but that scarcely matters. I see they are also available with a grey upper (and same brownish heel); equally nice. I was quite tempted to get the grey instead, but in the end went with black. I had thought about colouring the heel black, but at the moment I quite like it as it is. 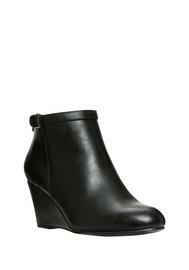 Ankle boots with with about a 3" wedge heel. Wore them today and they are comfortable and not noticeable under my boot cut jeans.